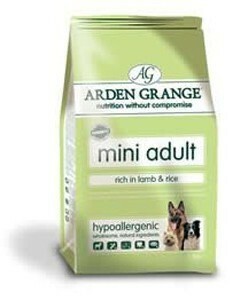 Arden Grange Small Dog Food Details: Arden Grange mini Adult rich in Lamb & Rice is suitable for all toy and small breeds. It is hypoallergenic, free from wheat, wheat gluten, beef, dairy and Soya products. Non of our foods contain artificial colourings, preservatives or flavours nor any added salt or sugar.